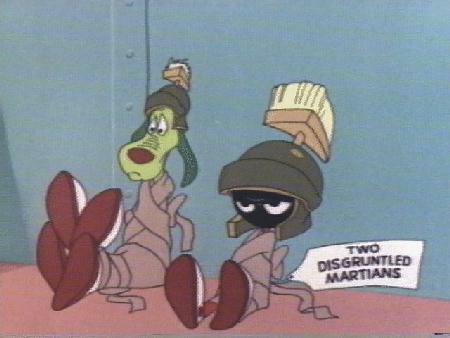 A new character called Marvin the Martian, and his trusty interplanetary travelling companion K-9, were revealed to the world by Warner Brothers in this cartoon. Their co-star was Bugs Bunny. As we would come to know...his mission is to blow up the Earth. 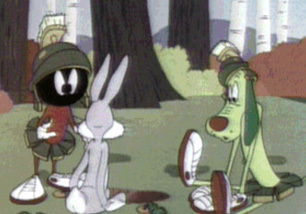 Once again Bugs Bunny co-starred with Marvin and K-9. Bugs is the target of a kidnapping to Mars after Marvin is ordered to bring an earth creature back to Mars by his general. Bugs is not amused and tricks the duo in various ways, convincing Marvin that K-9 is a traitor! Ever seen Buck Rogers? Well this is a Looney Tunes parody and a well done one too!Daffy Duck and Porky Pig co-starred. 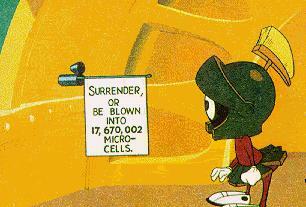 Daffy is Duck Dodgers, who ventures to Planet X seeking Illudium Phosdex,the shaving cream atom. He finds Marvin who is also trying to claim Planet X for himself because it is the last known source of the substance. 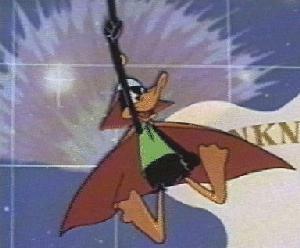 Porky Pig is Duck Dodger's eager space cadet, and at the end of the cartoon there's not much left of Planet X to claim after this quartet are finished with it! 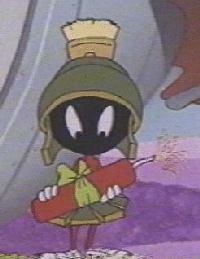 Marvin is set to destroy the Earth once more with his Illudium PU-36 Explosive Space Modulator; a weapon that he is very proud of. 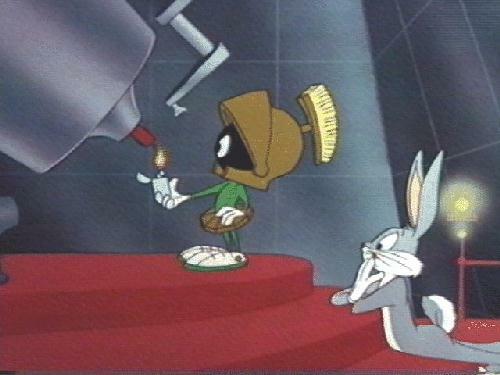 Bugs Bunny co-stars to steal the weapon and save the Earth but Marvin attempts to put a stop to the theft with 10,000 instant Martians...just add water! 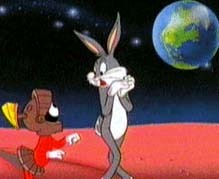 Bugs Bunny once again co-starred with Marvin, in which Marvin spies a spaceship coming toward Mars from Earth. It is Bugs Bunny and he crashes straight into Marvin's laboratory. Bugs is turned into a giant Neanderthal bunny when Marvin zaps him with his ACME Space-Time gun, hoping to turn him into a slave but failing to big time! Daffy Duck once again co-starred as Duck Dodgers who's given an assignment to protect the 'rack-and-pinion' molecule; used to polish yo-yos. Marvin, meanwhile is once again planning to destroy the Earth and enlists the help of Gossamer the Abonimable Snowman, whom he captured from the Himalayas on Earth. Marvin successfully kidnaps Bugs Bunny to provide Marvin's pet, Hugo the abominable snowman, with a companion. It doesn't succeed as Bugs convinces Hugo that Marvin is his own pet. Marvin then ends up being played with by Hugo as Bugs escapes. This specially released 3-D animation was only shown for a limited time in WB stores, at MovieWorld on the Gold Coast (Australia) and cinemas. Unfortunately it was not a world-wide release but it appears that it was screened in the U.S. also at selected venues. 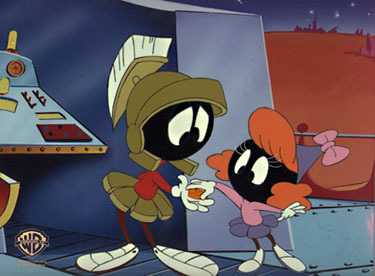 Marvin had a role in an episode called 'Duck Dodgers Jr.' His co-stars were Daffy Duck and Plucky Duck and it was the one and only time we ever saw his niece Marcia the Martian. 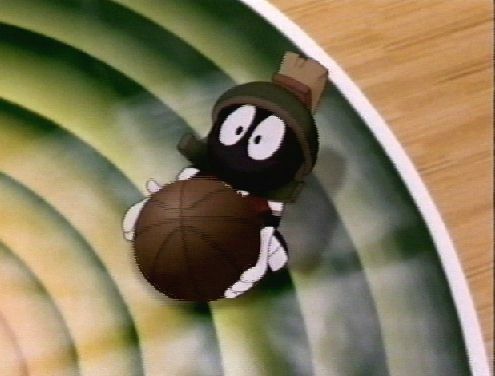 Marvin had a small role in one episode. Marvin stars as the referee in an American basketball film co-starring fellow Looney Tunes including Bugs Bunny, Tweety, Sylvester, and Michael Jordan. 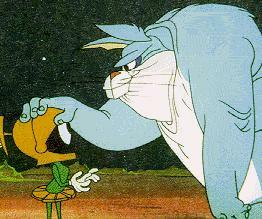 The Tune Squad must fight the Monstars in the first Looney Tunes film to be featured on the big screen. 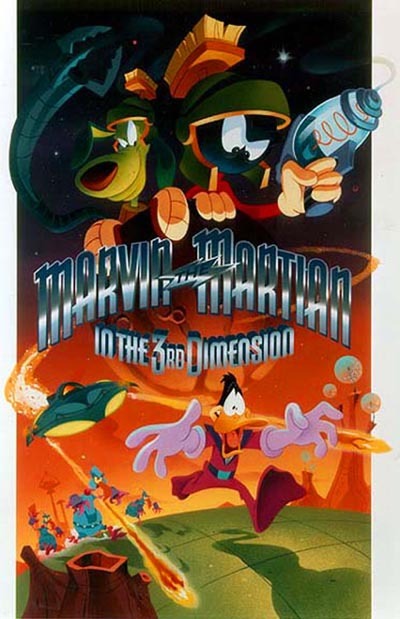 Marvin starred in the Sega Computer game, in which The Tasmanian Devil, Taz, has to escape from Marvin's interplanetary zoo. Marvin had a very quick guest appearance in this Simpsons episode that originally aired 12th January, 1997. He appeared in a line-up, in this parody of the X-Files, starring David Duchovny and Gillian Anderson. Homer Simpson was convinced that aliens had landed in Springfield.